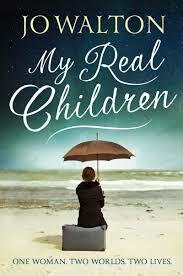 This review of My Real Children by Jo Walton first appeared in Interzone 255, November-December 2014. The alternative lives of women, that portion of the twentieth century experience obscured by patriarchal attitudes, has suddenly come to the fore in twenty-first century literature. Kate Atkinson dealt with the issue triumphantly in Life After Life, and now Jo Walton follows suit in My Real Children. The differences are instructive. Atkinson’s novel was written with mainstream sensibility but an awareness of science fiction; Walton writes out of a science fictional sensibility but with an awareness of the mainstream. Atkinson began (repeatedly) with birth and cast her story forward from that point, each new experience of life bringing its own surprises; Walton begins at the end of life, and casts her story backwards through memories. In fact, the very best chapter in Walton’s novel is the first one, in which an old and befuddled Patricia Cowan struggles to retain her dignity in a nursing home while trying to come to terms with experiences that seem disjointed and incoherent. For a brief moment the novel hesitates, allowing us to read these dislocations as a manifestation of Alzheimer’s disease or as two diverse timelines vying to be recalled. However, as soon as Walton identifies a turning point, the moment when Patricia either accepts or rejects a marriage proposal, the book resolves into a much more conventional story. She is a bright Oxford student in the immediate post-war years who takes a job teaching in Cornwall, but her aloof boyfriend fails to get the degree he anticipated and calls her with an ultimatum: marry me now or never. When she replies ‘now’ she enters into an unsatisfactory marriage in which she raises four children but is otherwise disappointed in life. When she replies ‘never’ she develops a passion for Italy, writes a series of successful guide books, and enters into a long and loving lesbian relationship. The two lives, recounted in alternating chapters, are familiar enough in outline: settling for a conventional married life is stultifying; independence is liberating. But the story Walton tells isn’t as simplistic as that. A woman’s life in mid-century is shown to have been limited by design. As a married woman, Tricia is unable to continue her career as a teacher, and with an unsupportive husband finds herself struggling to keep the home and raise her children without any escape. But as the marriage finally falls apart she is able to return to teaching, whilst campaigning for various good causes and eventually getting into local politics. Walton is careful to show the satisfactions even among the limitations. Gradually, also, we come to realize that the post-war world that Tricia is living through is not quite the history we recognize. The United Nations pulls the plug on the British and French adventure in Suez before it even gets going; as a result the Western nations are not distracted during the Hungarian Crisis and Russia pulls back. Slowly the world starts to follow a more peaceful, less confrontational path, and by the 1970s there is a permanent base on the moon with one of Tricia’s children the first person to get married on the moon. Pat, meanwhile, faces limitations in her own life. In particular, as lesbians there is no official recognition of their relationship, so she and Bee face the prospect that their children might be taken away from them, and when Bee is seriously injured by a terrorist bomb it is even difficult for Pat to get in to see her in hospital. This time, also, we see that the history unfolding around them is different again. The Cuban Missile Crisis ends with nuclear bombs exploding in Miami and Kiev; later China and India also use nuclear weapons against each other. There is a permanent moonbase in this world also, but it is of Soviet origin and part of a tense military standoff. In other words, an unhappy life for Tricia is matched with a happy world; a happy life for Pat is matched with an unhappy world. This equation is raised but, perhaps sensibly, not pursued by Walton, though the binary opposition of the two worlds can be a little too studied at times. The book is well written if somewhat sentimental towards the end, the characters are vividly draw though there are so many names that it can become difficult to keep track of who’s who and in which world, and there is a strong and heartfelt message conveyed by the novel. As a confident literary exercise it is head and shoulders above her Hugo-winning novel, Among Others, and yet, because we know the ending of her different lives right from the start, because the range of lives available to Patricia is limited to two, I couldn’t help feeling that My Real Children isn’t quite as daring as it should have been.